I truly enjoyed our coaching. You have a gift and I ended our sessions really appreciating both the insight and momentum I’ve gained in the last 6 months. Thanks again. P.S. 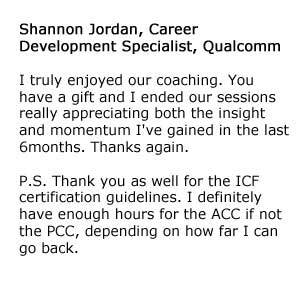 Thank you as well for the ICF certification guidelines. I definitely have enough hours for the ACC if not the PCC, depending on how far I can go back.